German personal pronouns are easy to remember and they are almost identical to those in English. Formal "Sie" is same as infinitive and plural conjugation. Plural conjugation is same as infinitive and formal "Sie". Same as infinitive and formal "Sie". Now we will try to use just learned German personal pronouns with some basic verbs. First-person singular is ich. Generally the form of verb is “root“+e. Ich lerne, ich wohne, ich komme. Second-person singular – du – informal. “root”+st. Du lernst, du wohnst, du kommst. Second-person singular+plural – Sie – formal. Same as infinitive. Sie lernen, wohnen, kommen. Third-person singular (he, she, it) – er, sie, es. “root”+t. Er/sie/es lernt, wohnt, kommt. First-person plural (we) – wir. Same as infinitive. Wir lernen, wohnen, kommen. Second-person plural-informal (you guys) – ihr. “first-person sing.”+t. Irh lernt, wohnt, kommt. Second-person plural (you) – sie. Same as infinitive. Wir lernen, wohnen, kommen. This is a very general rule of using German personal pronouns with verbs. There are exceptions but first you need to get used to basics. Quick note about “you” in German. 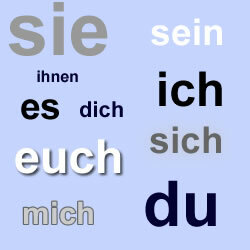 Unlike English, German has formal “you” – Sie and informal (familiar) – du. You have to remember it and try not to forget about it. We’ll speak about it in the next lessons but here is a simple rule: Use “du” if you know person good or he asked you to call him so. Otherwise, use “Sie”. We’ll show German personal pronouns in the table below and they will be in the nominative case. There are other cases as well but we need to know the basics first. We are partnered with The Vacuum Review and support their review of the Dyson DC24.